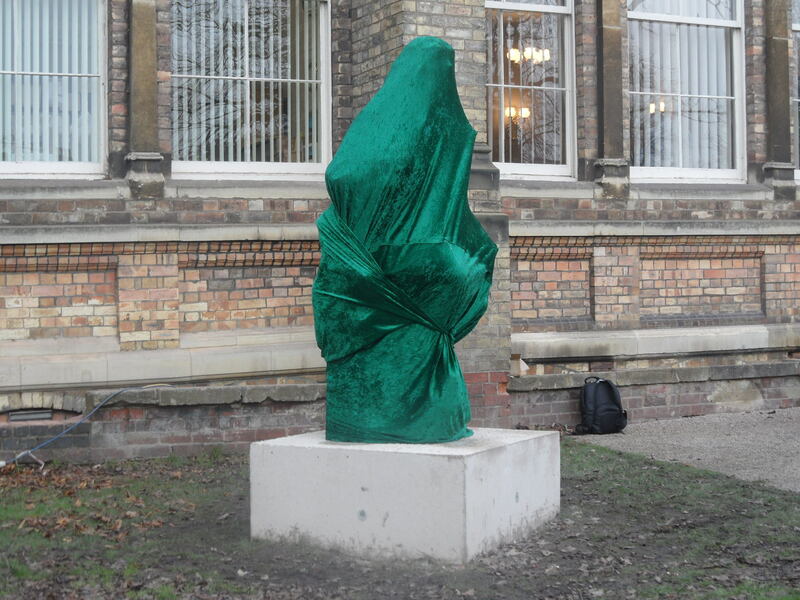 Despite the bitter cold, a large crowd gathered in the Museum Gardens around a figure enveloped in green velvet. 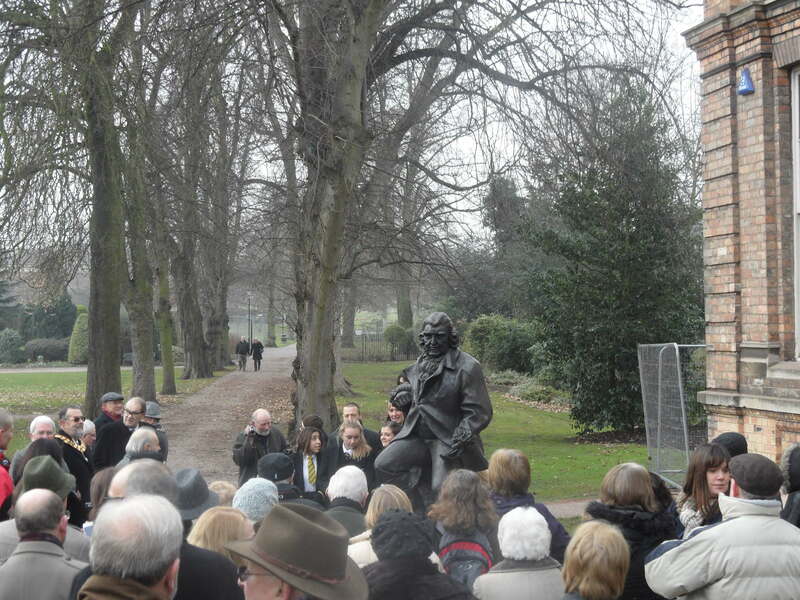 Once the poems, songs and speeches had concluded, local artist Peter Walker’s bronze statue of Erasmus Darwin was unveiled to applause. Recently, I read a wonderful post by Susan Ward on her Staffordshire Bred blog which reminded me of the importance of the sense of touch, when connecting with something. I was so pleased to hear that the scallop shell Erasmus Darwin holds in his left hand is not only an important symbol of his beliefs and his work on evolution, but is also there to be touched. This is not a hands off statue and I hope that people will touch it, that it will be a well-loved part of the city and that stories will grow up around it. Those days are still ahead of us – the sun has not even set on the statue’s first day in the Museum Gardens yet (although judging by the temperature in the park today, I’m not convinced it actually rose in the first place!). The statue belongs to the people of Lichfield, but today belongs to Erasmus Darwin and Peter Walker. I’ve used this database created by the Public Monuments & Sculptures Association a lot. It’s a national recording project that aims to collect information on all British public sculpture and monuments, whether historic or contemporary. 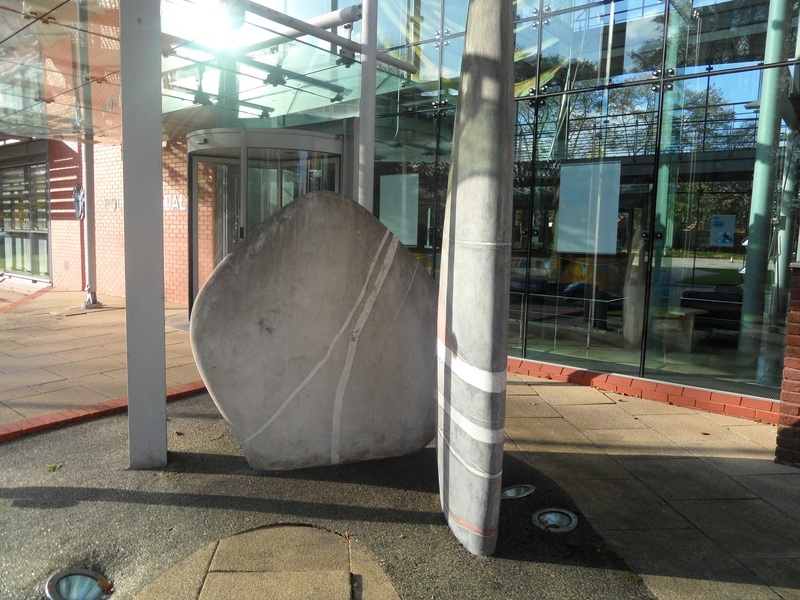 As well as including Lichfield’s usual suspects, the database also features some of our less obvious works such as the Calming Stone in Beacon Park, the etched glass in the Library foyer, the facade of Boots in Tamworth St and the Standing Stones I formed a bit of an attachment to back in November 2011. Facade of Boots created 1908. Decorations include an owl, a beehive and a piper. There must have been a good reason for this motley crew! Not everything on the list is still around – there’s an entry for Dean Denton’s Market Cross which was pulled down in 1849. There are also entries on the database that don’t seem to have made it as fully fledged pieces of Lichfield public sculpture. Since Pat brought it to our attention back in November 2011 an entry has now appeared on the database about the Vision & Youth sculpture. 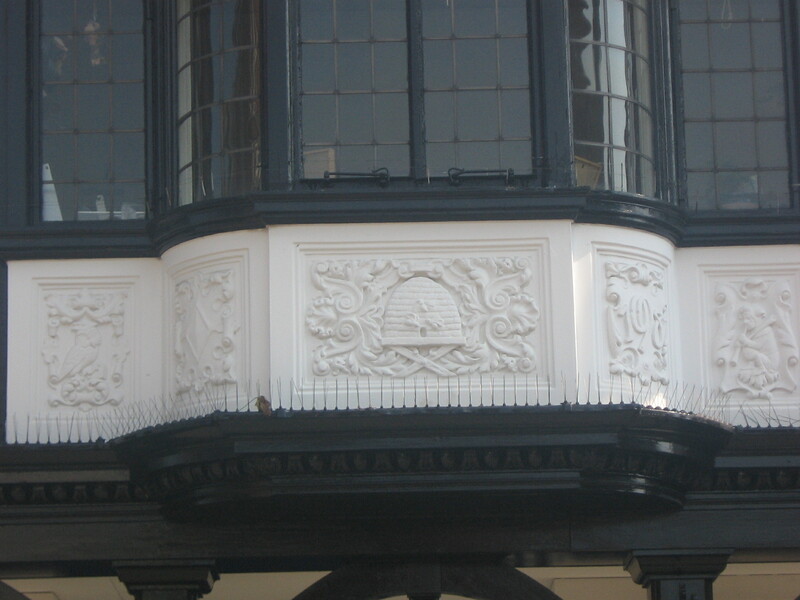 As the association says, ‘The database is an excellent resource for students & researchers, conservators, local historians, art buffs, enthusiasts, genealogists and all who want to know more about public sculpture: statues; obelisks; columns; sculptures; installations; fountains; follies; commemorative clocks; wayside markers; and towers – from the Stuart era to the present day.’ I think it’s fantastic and you can read more about future plans & how you can get involved in contributing information here. 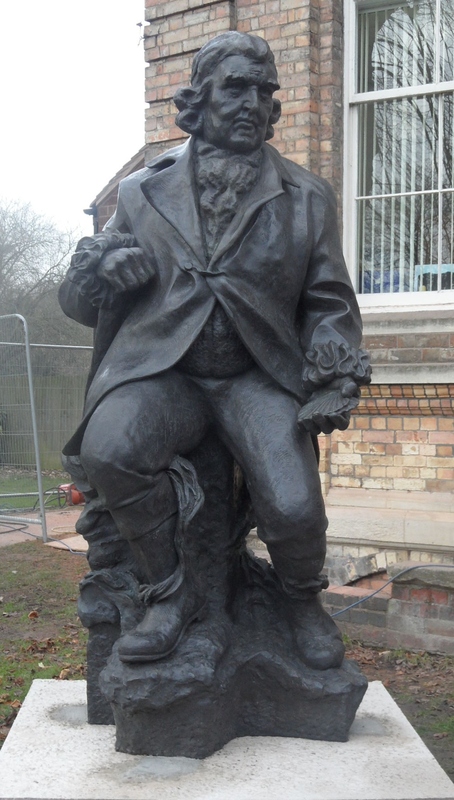 One to be added to the database in the future is the proposed statue of Erasmus Darwin at Cathedral Walk (I think there’s another one planned for Beacon Park too). I’ve just been reading a few of the comments about this on the S106 document. One person said that they were in favour of the statue, as Darwin is a local hero we should be proud of. However, the comment goes on to say that Lichfield should also celebrate more contemporary heroes relevant to young people and also more women ‘not just old blokes’. * I think this is potentially a whole new blog post but this is a really interesting point. Who or what should we be commemorating with our future public art & monuments?